I hesitate to explain my interpretation of my work, because I believe it limits what the observer feels free to contribute while viewing it. But this painting, “Love” has a very strong meaning for me and I want to share it. The image on the left is the entire painting. The image on the right is a close-up of the center of the painting. The medium is Atelier Interactive Acrylic Paint on a 22″ x 28″ Stretched Canvas. This painting began as all of my “Creative Energy” paintings do, by squeezing paint directly from the tube onto the canvas, picking up whatever color calls to me. Next I completely cover the canvas with paint, including the sides, using a large brush, without regard to making it be anything in particular. Next I follow lines and colors, observing the painting from various angles and distances, and add colors and forms and lines as the painting directs me. I call them “Creative Energy” paintings because I have discovered that when I can get my ego mind to be quiet and let the energy flow through me the painting will pretty much create itself. Whatever is going on in my life will definitely have an impact on what evolves in the painting but mostly on a subconscious level. And in this way “Love” came into being and only when it was finished did I understand what it meant to me on a conscious level. 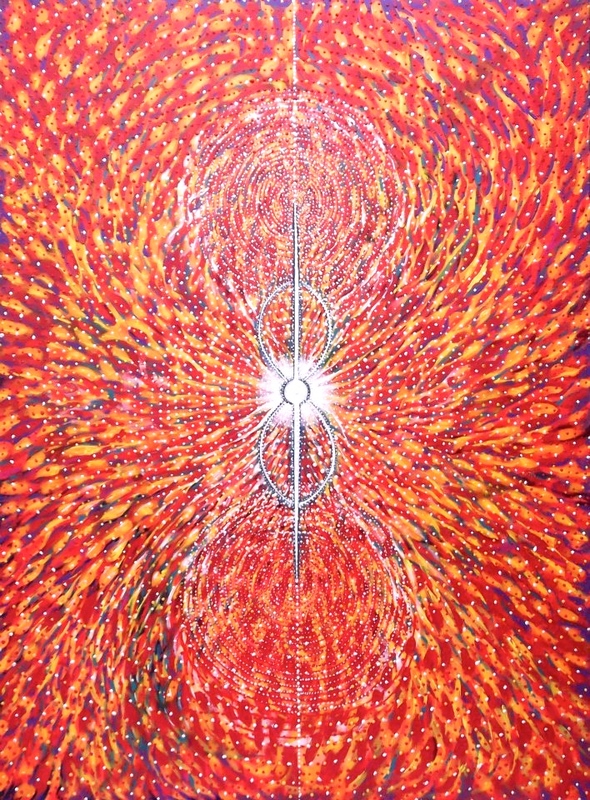 In the center of the painting is the Ultimate Source, Pure White Light, the Source of all energy, life and creativity. Everything radiates from the Source. Also is formed the symbol of Infinity. Above and below the Source are two more of an infinite number of points of light. They emanated from the source and become the source for an infinite number of other points of light. It tells me that all beings and all matter and all energy are created by the Ultimate Creator, The Source, in the Image of the Ultimate Creator which is Pure Creative Energy. Therefore it is not only our birthright but also an inescapable endowment that we are all creators. We are constantly creating, whether we are conscious of it or not. I believe it is not only possible, but the intention of the Ultimate Creator, that we consciously direct our creative energy while simultaneously submitting to the power of Ultimate Creativity. I don’t know much about science, but I’ve heard that matter can neither be created nor destroyed. Rather it is constantly moving from one form to another. 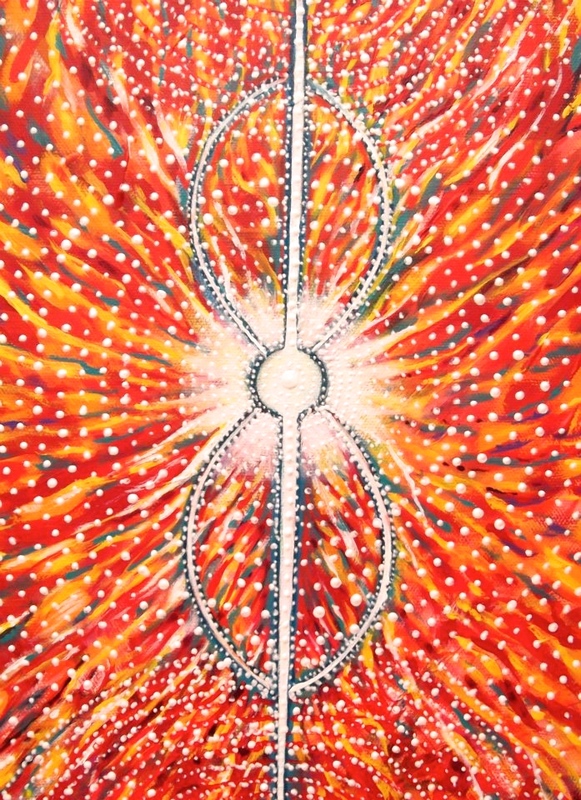 When I look at this painting, I see atoms in a constant exchange of energy, connecting all beings – all matter, as if I’m looking into a microscope. I also see the cosmos as if looking through a powerful telescope. I breathe in atoms that were once a part of you. I breathe in energy that sustains me, that came from the Ultimate Creator, in whatever form to which I evolve.